Apple has recently made iOS 8 available for the public. If you have an iPhone 5s with you and haven't updated it to the latest iOS just yet, then this post will be useful. It will guide you through on how to clean install the new system. Direct links are also provided so that it would even be easier for you to update your iPhone. Step 1: Download iTunes 11.4 as it has full support for iOS 8. Step 2: Backup your device via iCloud or iTunes. It is imperative you do this before you start installing iOS 8 on your iPhone 5s. Step 3: Download iOS 8.0 for your device; click here to download iOS 8.0 for iPhone 5s GSM, and click here to download the firmware for the CDMA model. 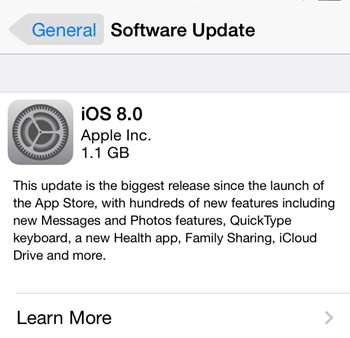 Step 4: If you want the iOS 8.0.2, here are the links: GSM Model, CDMA Model. Step 5: Launch iTunes on your computer. Step 6: If you're using a PC, press the Shift key and click the Restore iPhone button on iTunes. For Mac users, press the Alt key and click the same button. Step 7: iTunes will now prompt you to choose the .IPSW file you want to install on your iPhone 5s. Step 8: Navigate through the directory and select the file. Step 9: Wait until iTunes is finished installing the new update. This process will take few to several minutes to complete so be patient. Step 10: Once installation is finished, your iPhone 5s will now be running iOS 8.0 / 8.0.2. For iPhone 5s owners who are currently running iOS 7.x, you can also receive a notification about the availability of the OTA update. If you decided to take the route in updating your phone, still don't forget to backup all your data.